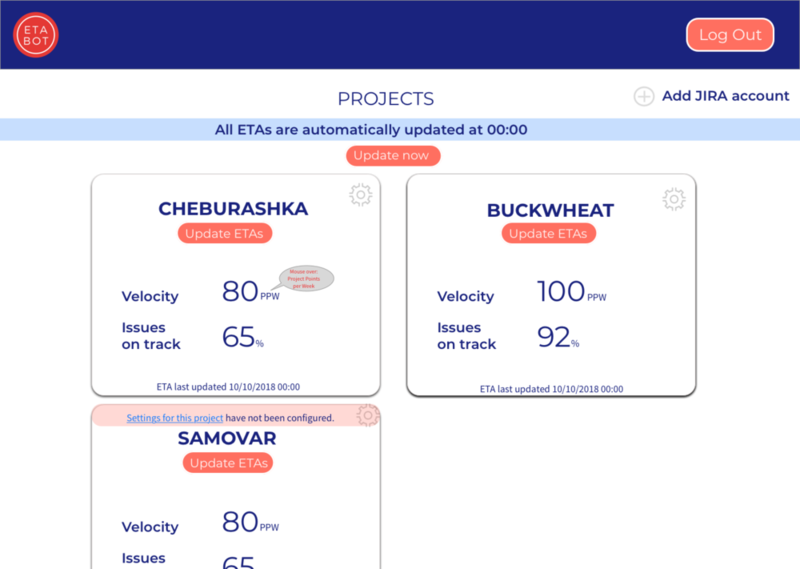 ETAbot is a software platform that connects to a Project Management system, and uses machine learning to accurately predict when a task will be completed, then communicates the revised deadline to stakeholders. Our team is composed of several physicists, software engineers, and one designer. The problem we’re tackling is born out of real world experiences we had in the workplace. When your time is already allocated to a pile of tasks, an influx of unscheduled work can be overwhelming. Priorities shift. How do you know when all your tasks will be done? And how do you keep multiple stakeholders in the loop about delays? We are designing an AI-powered platform to lessen the burden of task tracking. ETAbot looks at your productivity (“velocity”), availability, and priorities to calculate how long it will take you to accomplish tasks. Then it updates you—and the people impacted by the changes—via email and Slack, helping your team to make realistic plans. Final deliverable: a fully-functional web app (to come). We hypothesized that we would likely have two target audiences in mind for the product. First, we interviewed Project Managers/Scrum Masters in the advertising, web design, and software development industries about their pain points. There is a plethora of Project and Task Management systems out there (one PM said he had personally used 35-40!) but none of them were offering realtime tracking for tasks. The PMs told us that despite all the software options, they still often had a lack of visibility into their direct reports’ progress on individual tasks, and just had to accept their estimations. We also did interviews with some individual contributors to see if they had had similar experiences to us with communication breaking down when task deadlines shifted. They felt that keeping managers in the loop was time-consuming and burdensome, and thought automating that process would help. We decided to focus our efforts on designing a solution that was for just one Task Management System to begin with (JIRA), and to start building out the individual contributor’s side first, because that was the point of view we knew best. I looked into 12 other tracking tools and found that there were a number of task management Slackbots, as well as some Project Management add-ons that could connect to JIRA, but no solution that spanned both of these things. 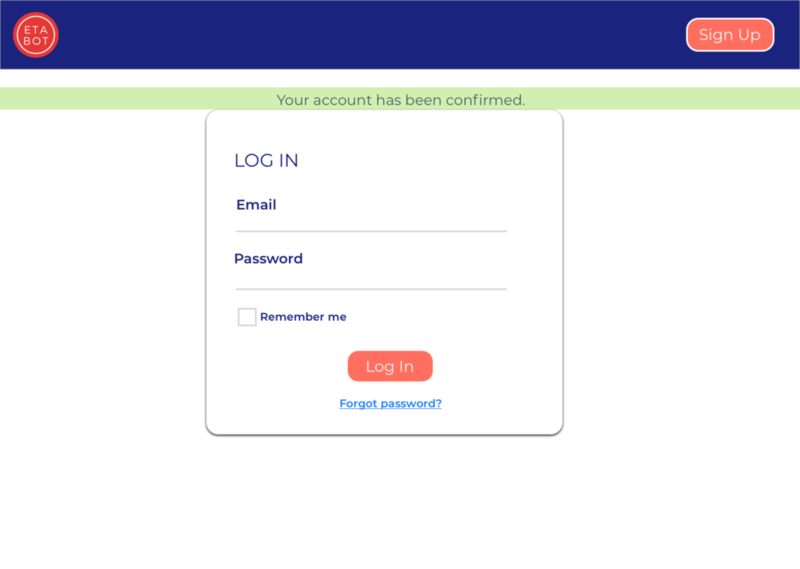 My role with ETAbot thus far has been to design the flow for the log in/sign up/connect-to-JIRA process, as well as the UX/UI for the Projects Page where a user can update the ETAs for his or her JIRA tasks. I’ve also done the UX writing for the site. 3. figuring out what a user sees on the front-end when there is a backend process that takes time to complete. Is there something better than a spinning wheel? What computational compromises do we have to make in order to make sure the user doesn’t get bored and bounce? ETAbot is still a work in progress. If you’re interested in trying our Alpha version of the site, get in touch!